Featured in the Los Angeles Times on January 15, 2018. I chose purses as my canvas as a way to marry the powerful, politically-charged language of todays resistance (often direct responses to Trumpian statements) with representations of women's modern economic power and the possibilities for change that come with it. For me, the use of purses from the mid-twentieth century also calls back to that critical era in the womens movement and reminds us how much power we can have to effect meaningful change. The title of Power of the Purse is inspired by the recent passage of Republican tax reform and its far reaching negative implications for womens rights. It is also a call to action for women, and men, to redouble their efforts to fight the growth of moneyed privileged and show up at the polls. 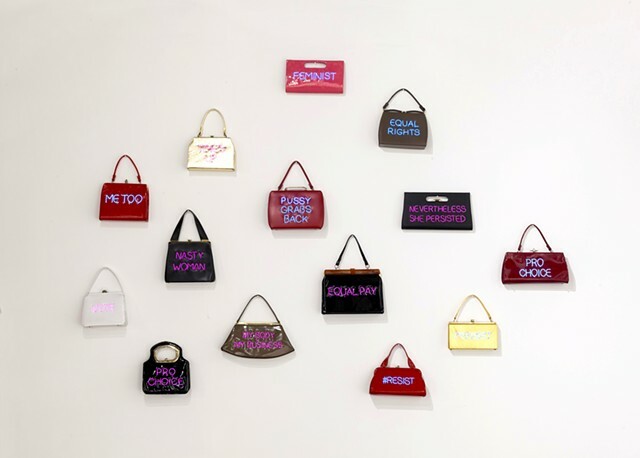 The purses are meant to be carried and serve as small-scale political billboards. The text on each purse is created using Electroluminescent wire that is lit up using batteries and a small electronic driver that can be set to constant or flash mode.